Intel is putting its energy into the development of smart grid standards and monitoring systems in Germany, with company executives announcing a number of initiatives at the Cebit trade show Monday. 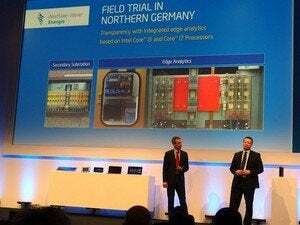 With Westfalen Weser Energie, it is developing smart monitoring systems for the regional utility’s electrical substations, said Hannes Schwaderer, Intel’s director of energy and industrial applications for Europe, the Middle East and Africa. In Germany there are around 1 million secondary substations, which transform electricity from medium-high voltages down to the 220 volt supply found in homes and offices, said Detlef Gieselmann, the utility’s senior vice president of business development. In residential areas, each substation typically serves 100 to 150 people, with others serving commercial or industrial sites, he said. 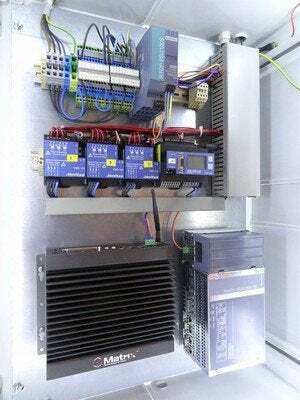 So far, the company has equipped just two substations with industrial PCs built around Intel Core i5 processors, and additional instrumentation to measure voltage and current. However, those PCs log and report as much data on the status of the substation as around 200 of the utility’s legacy SCADA systems, so the next phase of the joint project is to develop software tools to handle the increased data flow. The partners are doing that at two levels: On the server side they are working on “big data” techniques to glean useful business information from the mass of measurements received, while on the client side they are looking for ways to pre-screen the data, reporting only short summaries of it when all is going well, and raising an alarm and forwarding more data when an anomaly is detected. The PCs chosen for the project use the Core i5 processor because, like the larger i7, it includes Intel’s Active Management Technology, a hardware feature that allows remote troubleshooting and recovery of the system, and reporting on the presence of software security agents. It’s vital to think about security from the start, said Gieselmann, because substations are rarely visited after the equipment is installed—perhaps once every five to 10 years for an audit or maintenance check—and yet every PC installed will become a new IP gateway on to the utility’s internal network, providing potentially dangerous access to critical infrastructure. That’s why another of the initiatives announced involved a collaboration between two Intel business units to develop a security platform for smart grid components. Security software vendor McAfee is working with embedded OS developer WindRiver to deliver end-to-end protection for the smart grid, said Raj Samani, CTO for McAfee Europe, Middle East and Africa. This will enable utilities to securely manage each secondary substation from a central location, he said. “Malware is getting lower down the stack and so protection is having to get deeper and work harder,” he said. Another vital factor in connecting up smart grid elements will be having them all talk the same language. To that end, Intel is joining the EEBus Initiative, a German smart grid standards consortium, said Christian Morales, the company’s vice president and general manager for Europe, the Middle East and Africa. Morales also said that MVV Energie, a utility based in Mannheim, Germany, is using Intel’s Puma 6 smart home gateway in a large-scale trial with its customers of secure decentralized energy management. The Puma 6 is based on an Atom chip and allows consolidation of functions including Internet access, TV, home security and energy management in one device, according to Intel.The need for consolidation and common standards in the field of smart energy management was underlined by the EEBus Initiative Monday, as it and 10 other IT and energy industry associations signed a joint declaration committing to make Germany the leading market for smart home technologies and calling for the development of manufacturer-independent standards for smart home and smart grid communications.